Motorized mobile flat screen tv cart for 42"-100" (interactive) flat-panels. 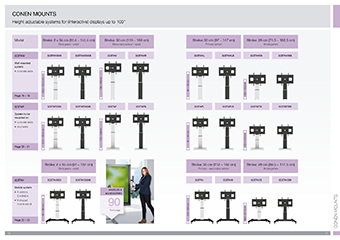 Renowned for its stability and versatility the SCETAV28B mobile monitor stand has been Conen Mounts worldwide best-selling mobile stand for many years. The monitor stand is designed to withstand intensive daily use and to safely support displays up to 100" or 150 kg. The SCETAV28B monitor cart features the standard center column, offering 28 cm of smooth motorized height adjustment. 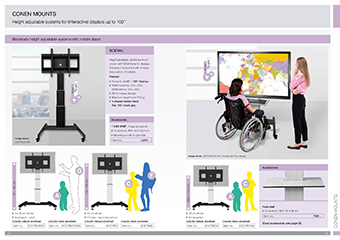 For user convenience and to enhance the teaching experience the stand allows for several accessories to be mounted, including PC shelves, handles and whiteboard side wings. Heavy duty mobile monitor cart for displays up to 100"
Center to floor distance 920 mm - 1200 mm 36.2" - 47.2"
Height 1240 mm - 1520 mm 48.8" - 59.8"